The first book in Richelle Mead’s brand-new teen fiction series—set in the same world as Vampire Academy. Populated with new faces as well as familiar ones, Bloodlines explores all the friendship, romance, battles and betrayals that made the #1 New York Times bestselling Vampire Academy series so addictive—this time in a part-vampire, part-human setting where the stakes are even higher and everyone’s out for blood. I am really wanting to read this book as I missed out on Mead's previous series that everyone has raved about. Great pick! I'm glad someone featured this book, I almost did too actually! I can't wait for this to be released! I absolutely love Richelle Mead and the entire Vampire Academy Series was AMAZING! I miss reading about those characters so much, so it will be fun to see some of them resurface in this series! I'm probably the last person on earth to read the VA series (I've only read the first) but I plan on changing that in the near future - I'm still excited for Bloodlines, though! I'm looking forward to this one as well! 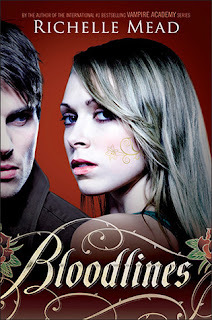 I still have to finish the Vampire Academy series but I know I'll want to read Bloodlines when it comes out. I have only read the first two books in the VA series but I plan on reading the rest before this one comes out. I've read the first two of the Vampire Academy books, and it seems a little strange that Richelle Mead's using the same world for her new books. I know a lot of authors do it, but I don't know. I guess I expected her to branch out a little. I'll be back again to visit soon - I love the Bookcase Showcase feature! Btw, LOVE THE BLOG... I am not sure if we're fellow followers, but I follow you! Strangely, I'm really looking forward to this as well. Despite having not read ANY of the books in the Vampire Academy series :) I have so much catching up to do!